Have Remainer MPs even heard of the EU’s “Eastern Partnership”? The EU’s “Eastern Partnership” celebrates its 10-year anniversary in just two weeks’ time. Today and tomorrow, unelected EU Commissioner for European Neighbourhood Policy and Enlargement Negotiations Johannes Hahn is in Yerevan in Armenia for further discussions. What is the EU’s “Eastern Partnership”? The Eastern Partnership (EaP) is a policy initiative which aims to deepen relations between the European Union, its Member States and six of its Eastern neighbours: Armenia, Azerbaijan, Belarus, Georgia, Moldova and Ukraine. The EaP is part of the EU’s “European Neighbourhood Policy” which governs its relations with 16 of its eastern and southern neighbours. To the South: Algeria, Egypt, Israel, Jordan, Lebanon, Libya, Morocco, Palestine, Syria and Tunisia, and to the East: Armenia, Azerbaijan, Belarus, Georgia, the Republic of Moldova and Ukraine. What does the EU say about this? This may come as news to the people of the Ukraine in particular, which has seen its country torn apart by civil war against a Russian-backed militia in the east of the country. Russia has also illegally annexed the Ukrainian territory of Crimea, in the south. Many commentators have argued that the EU’s overly-assertive moves to bring the Ukraine into the EU were seen by Russia as a direct threat, given the size of their neighbouring country, and that this is what caused Russia to act. Where else is the EU expanding? So, aside from Armenia, Azerbaijan, Belarus, Georgia, Moldova and Ukraine, where else is the EU trying to expand? The “Eastern Partnership” must not be confused with the EU’s primary targets for expansion, which are the six Balkan countries of Macedonia, Albania, Montenegro, Serbia, Bosnia & Herzegovina, and Kosovo. The latter country is still not even recognised by many countries around the world. The EU has six Stabilisation and Association Agreements in force with these countries, which started in 2004 and with the most recent being with Kosovo. 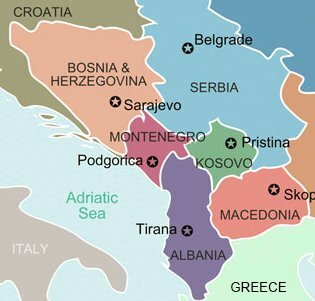 Serbia and Montenegro have already started negotiations and are underway in terms of their desired membership. These are the two countries that Juncker says will be members within six years. Finally there is Turkey, not part of the Balkans arrangement, but still an EU accession country. How important are all these countries? To the EU they are all very important, particularly since the British people voted to leave. 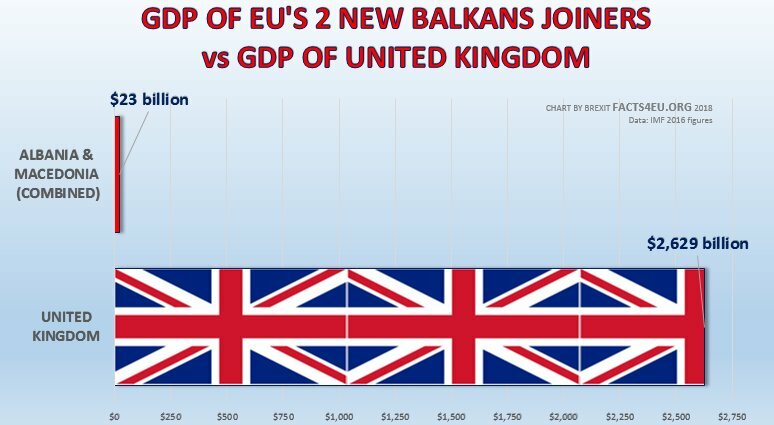 When the latest two countries were granted accession status last year (Albania and Macedonia), Brexit Facts4EU.Org produced a simple chart showing the difference between the UK leaving and these two countries joining. As can be seen, the effect of these countries joining the EU can only mean another enormous drain on those EU countries which are still members. If all these very poor countries join the EU, this will barely add to EU GDP but it will most definitely soak up vast resources from member countries. Why are we running this piece today, when Remainer MPs are doing their utmost in Parliament to sink Brexit? The answer is that readers have a wide variety of news outlets available to them which will obsess about individual MPs and the machinations in Parliament today. How many Remainer MPs have heard about the EU’s “Eastern Partnership” with Armenia, Azerbaijan, Belarus, Georgia, Republic of Moldova, and Ukraine? How many Remainer MPs can list which countries have either accession status or candidate status to join the EU? How many Remainer MPs are prepared to accept the massive calls for more taxpayer money from the UK when these countries join? Finally, how many Remainer MPs could even point to any of these countries on a map? 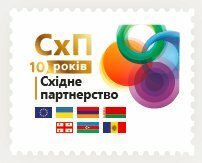 Oh, and if any of these Remainer MPs are philatelists, here's one of the EU's proposed postage stamps to mark the 10 year anniversary of the "Eastern Partnership". You're welcome, comrades. Excellent piece which I will spread to my friends and others as widely as I can. The eu hasn't learnt a thing, onwards socialist banging the same tune, hoping for a better one. Definition of madness. The EU as a concept shows strong resemblance to an upside down pyramid scheme. The longer you're part of it, the more of your investment you lose. Off topic, but could Facts4eu please publish the list of all MPS who vote for Yvette Cooper 's amendment. This, in my opinion will prove who the true Brexit wreckers are. Love the stamp, copyrighted by the EU. Without that, many would be saying "It's simply not true" - when it is, just like the EU army, tax harmonisation, federalisation etc. Like all empires, they need to expand or die. These pro-EU people really do 'appear' to be stupid. Have they not noticed the continuing changes that have happened since the Referendum. For those that voted 'remain' for the 'status quo', it's not even what you voted for any more. Talking of stupid, any MP considering voting for May's fake leave should know that the people have not, & will not be conned. We don't care what excuses you make for not enacting the referendum vote. No deal is better than a bad deal, and this is BAD. We haven't been taken in by the smokescreen that it's 'just' the backstop that's the problem. The rest is just as appalling & ensures that we do not really 'leave'. Some, it would seem, are going to vote for it out of fear (of the Party). Have they met a betrayed electorate yet? A vote for this demonstrates that democracy in the UK is dead. All bets will be off. We voted to leave. It was not conditional on anything else. We're past 'Just get on with it'. It's 'Just (insert swearword if inclined) LEAVE'. Liked your comment Not4EU 'Talking of stupid...' - and sent it to my MP. Note: Anyone thinking of standing for local elections needs to get on with it. I received an email from the Social Democratic Party today. If you want to stand for them you need to apply to the authorities for a Basic Disclosure Check today, so as to get it back by March. Too, you need to apply to the SDP to be a candidate by 15th February. I imagine it will be a similar procedure for any other party. If you stand as an independent then you probably have more time. Candidate Nominations have to be submitted by Wednesday 3rd April 4pm for all candidates. Unfortunately it is not information the BBC or the media at large care to disseminate, Everything in the EU is Hunky-Dory by the pro-EU press and remainers. They are not prepared to look below the surface and look at the parlous state Italy is in. The new EU Parliament this year could upset the Brussels apple-cart. "EU Parliament Boss: Efforts to Prevent Mass Migration From Africa a Betrayal of Europe" - according to Breitbart today 30.01.2019 - what a lot of rubbish. No wonder 17.4 million voted to LEAVE. That has to go down as one of the most idiotic things I have ever read about the eu.